Most youngsters get baseball advice from their fathers while growing up. That's still the case for Daniel Fields. The Tigers' No. 3 prospect tied a career high with four hits, including a homer, and drove in a pair of runs on Wednesday night as Double-A Erie defeated Trenton, 9-7. Fields, who fell a triple shy of the cycle, also stole his 19th and 20th bases and scored twice. He broke a 5-5 tie in the seventh inning with a solo shot, his ninth, then capped the scoring with an RBI double in the eighth. "Just trying to see the ball and get that foot down," Fields said. "Trying to recognize pitches that are out of the zone and as soon as I can." Fields has stepped up his play of late, batting .340 (36-for-106) with 15 RBIs in 26 since the end of June. He credits the surge to work he's done with his father, Bruce, Detroit's Minor League hitting coordinator. "Just trying to get the extra work in in the cage," the 22-year-old center fielder said. "My dad and I, we've been talking about some stuff, tightening up my swing, getting in the cage, hitting off the tee. Not really doing anything too different, just trying to stick with what I had in Spring Training because I felt good in Spring Training." Fields' longball on Wednesday was his second in five games after homering just once in June and July. June was a particularly rough month for the 2009 sixth-round pick, who totaled 17 hits in 19 games while compiling a .651 OPS. "Not pressing and not trying to do too much at the plate," Fields said of the difference between now and then. "I know I can get into stretches where I try to do too much and that causes me to swing at bad pitches. When I'm focused and relaxed at the plate, it helps me see the ball well and lay off pitches I don't want to hit." Tyler Collins, the Tigers' No. 13 prospect, drove in a pair of runs and Wade Gaynor chipped in two hits and two RBIs for Erie. 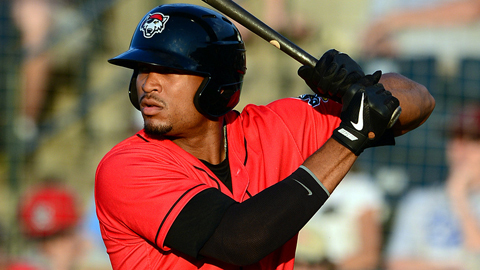 The SeaWolves have won three in a row to remain atop the Eastern League's Western Division. Ramon Flores, the Yankees' No. 16 prospect, homered and drove in a career-high five runs for the Thunder. Robert Emrich is a contributor to MiLB.com. Follow him on Twitter @RobertEmrich. This story was not subject to the approval of the National Association of Professional Baseball Leagues or its clubs.